Yuka Roll and Pho, just across the Boulevard on Vaughn, is a really great and affordable place to eat. We’ve been there twice, and it may be the best place in town for sushi – at least when you mix in factors like price, crowd, quick service, and variety. Montgomery’s sushi scene has always been kind of a mixed bag. We’ve never had a fancy higher-end local place like Homewood’s outstanding Jinsei, with its cucumber mojitos, mood lighting, and spa-like bathrooms. And over the years, we’ve had pretty good sushi at a few places here in Montgomery. 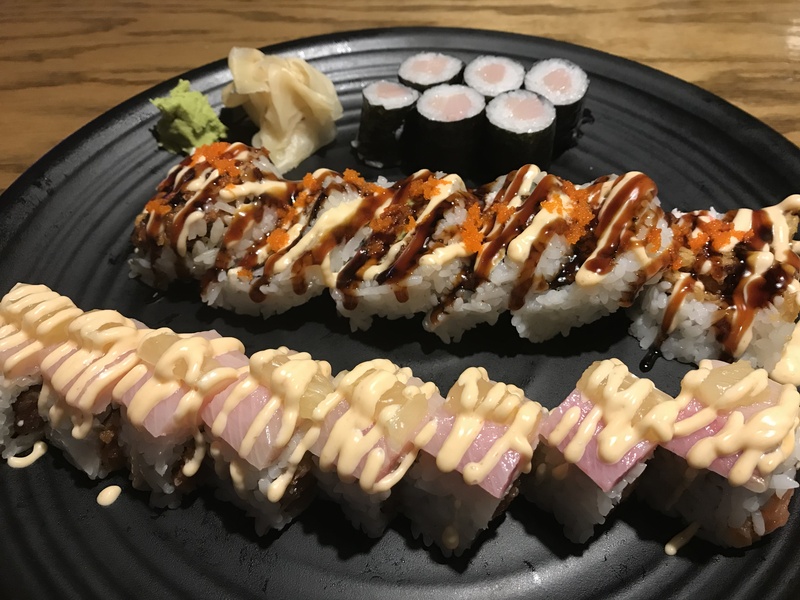 Some friends swear by Sushi Cafe (on Zelda, near Publix), but that lunch scene is pretty darned congested and has a bit of a mass-produced feel to us. The less said about downtown’s Wasabi the better. Our previous favorite was Rock N Roll Sushi, out by the Whole Foods, but that’s pretty far away. And, as we’ve noted, a lot of their stuff comes loaded down with fried parts and excessive mayonnaise (any mayo is, to our mind, too much mayo for good sushi) – though it’s still a good place if you find yourself marooned out in the far eastern land of chain restaurants. But back to the virtues of Yuka. The folks there are super friendly, and the service is fast. Both times we’ve been for lunch the place was pretty empty. And it’s really cheap! The banner outside advertises that the rolls are half price. This isn’t a temporary sale, as far as we can tell – the printed menu also contains the “half off” pricing. This means you can splurge a little, getting more than enough to share with a friend for the cost of just one person’s meal at another place. Our favorite of the things we’ve tried so far at Yuka is the Vaughn Roll, which has lemon in it – a surprisingly nice and bright complement to the fresh fish. They’ve also got the usual familiar selection of rolls, including a bunch of hand rolls, and also things like seaweed salad (delicious, and about twice as much as you get at Fresh Market for about half the price). Folks who live as close as we do to the Gulf can sometimes take fresh seafood for granted. It’s definitely a luxury of living around here. It’s not sustainable to eat fish all the time, and we don’t eat it very often ourselves. But when you do, it’s worth going somewhere that you know is going to take extra care to have a lovely presentation so you can savor the experience. Yuka offers that, and at a very reasonable price. Kate and Stephen are Midtown residents with two cats, a dog, fifteen fish, a garden, an old house and a sense of adventure. They write about life in Midtown here and about life in Montgomery at their blog Lost in Montgomery.